What is the Advanced Adjustable Elbow Support? The advanced adjustable elbow support is a neoprene wrap that can be easily applied to a swollen or an injured elbow to provide support and compression. The elbow support features adjustable hook and loop closures to ensure of a totally comfortable fit. When can I use the Advanced Adjustable Elbow Support? Use the advanced adjustable elbow support to immobilise your elbow following elbow fractures or elbow surgery as well as to help relieve pain caused by elbow arthritis. How does the Advanced Adjustable Elbow Support work? Featuring Coolmax fabric lining to keep you cool and comfortable the advanced adjustable elbow support provides compression to the elbow area providing reassurance during activity. The elbow support features hook and loop closures that easily adjust for an easy, custom fit. The warmth provided by the neoprene elbow support provides therapeutic heating within the tissues which helps to increase blood flow to the area. This therapeutic warmth and support is effective in relieving the aches and pains of arthritic conditions as well as painful elbow fractures. Use a mild detergent and cold water and leave to dry - the elbow support is not suitable for use in a washing machine or dryer. One size fits most - fits an elbow circumference of up to 36cm (14 1/4"). 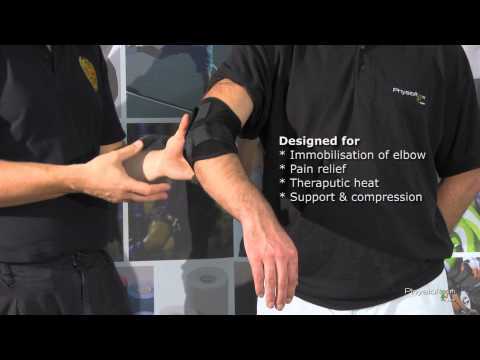 PhysioRoom Advanced Adjustable Elbow Support - Pain Relief for Tennis Elbow, Arthritis - Neoprene is in stock and available for immediate dispatch from our Warehouse facility in Lancashire, UK. Orders placed by 4pm Monday to Friday (excluding Bank Holidays) are dispatched the same day. If you need your PhysioRoom Advanced Adjustable Elbow Support - Pain Relief for Tennis Elbow, Arthritis - Neoprene in a hurry, next working day delivery is available for UK mainland addresses.